Aussie carmaker Holden has unveiled a new Snapchat campaign just in time for the NRL State of Origin series, becoming the first auto brand to run a Sponsored Lens in Australia. The lens allows users to choose their team (NSW or Queensland) and swat away the other team. Holden has also created Snap Ads for State of Origin in Snapchat’s ‘Our Story’ (formerly known as ‘Live Story’) feature which target sports fans based on the content on the app. The ads are full-screen and play with sound, with Holden running half the video ads in ‘Our Story. 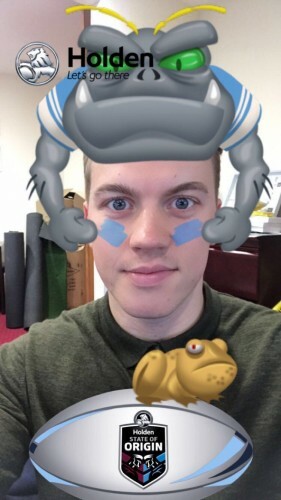 Holden has also created a Snapchat filter over the stadium for State of Origin. The campaign also marks the first time Snapchat has covered State of Origin through ‘Our Story’, which will string together content our community submits from the game, around the stadium and in the stands into a chronological narrative. Emma Pinwill, general manager of brand, media and sponsorship at Holden, said: “As a brand, we wanted to take full advantage of the partnership we had with the State of Origin by reaching a more modern and progressive audience in a meaningful way.